The information provided below applies to Individual On-Exchange plans unless otherwise noted. For specific definitions, please review your specific policy/plan materials (ex. benefit booklet, application, Summary of Benefits and Coverage). Additionally, this information does not modify any of the terms of your health insurance policy/plan. Further, all of this information is pending regulatory approval. Billed Amount If the billed amount for covered services is greater than the allowed amount, you are not responsible for the difference. You only pay any applicable copayment, deductible, coinsurance, and non-covered expenses. (See Filing Claims below for additional information.) You may be responsible for paying any charges over the allowed amount in addition to any applicable copayment, deductible, coinsurance, and non-covered expenses. Care Outside of North Carolina Your ID card gives you access to participating providers outside the state of North Carolina through the Blue Card® Program, and benefits are provided at the in-network benefit level. If you are in an area that has participating providers and you choose a provider outside the network, you will receive the lower out-of-network benefit. Also see "Out-Of-Network Benefit Exceptions." In an emergency, in situations where in-network providers are not reasonably available as determined by Blue Cross NC's access to care standards, or in continuity of care situations, out-of-network benefits will be paid at the in-network benefit level. However, you may be responsible for charges billed separately by the provider which are not eligible for additional reimbursement. 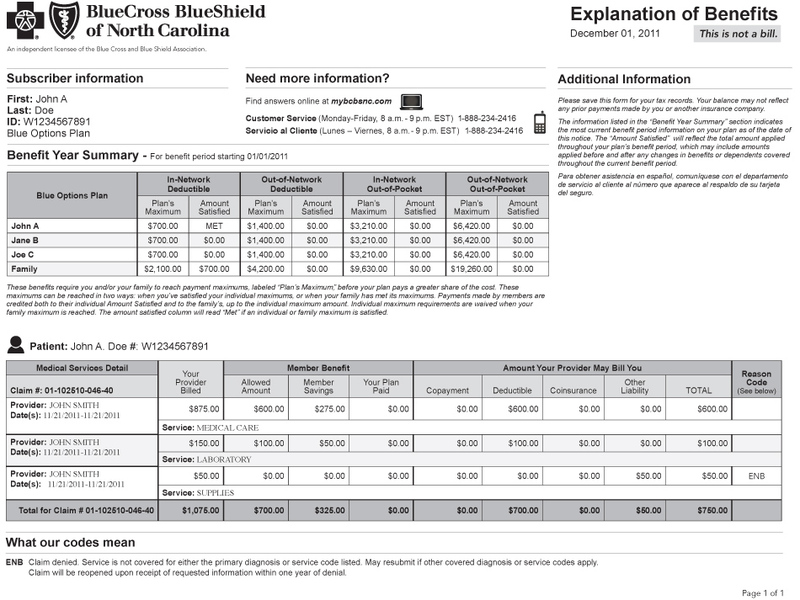 If you are billed by the provider, you will be responsible for paying the bill and filing a claim with Blue Cross NC. An enrollee, instead of the provider, submits a claim to the issuer, requesting payment for services that have been received. In-network providers in North Carolina are responsible for filing claims directly with Blue Cross NC. However, you will have to file a claim if you do not show your ID card when you obtain a prescription from an in-network pharmacy, or the in-network pharmacy's records do not show you as eligible for coverage, or you are in your three month grace period if you receive a federal subsidy. In order to recover the full cost of the prescription minus any applicable copayment or coinsurance you owe, return to the in-network pharmacy within 14 days of receiving your prescription so that it can be reprocessed with your correct eligibility information and the pharmacy will make a refund to you, if necessary. If you are unable to return to the pharmacy within 14 days, mail claims in time to be received within 18 months of the date of the service in order to receive in-network benefits. Claims not received within 18 months from the service date will not be covered, except in the absence of legal capacity of the member. You may have to pay the out-of-network provider in full and submit your own claim to Blue Cross NC. Claims must be received by Blue Cross NC within 18 months of the date the service was provided. Claims not received within 18 months from the service date will not be covered, except in the absence of legal capacity of the member. A QHP issuer must provide a grace period of three consecutive months if an enrollee receiving advance payments of the premium tax credit has previously paid at least one full month's premium during the benefit year. During the grace period, the QHP issuer must provide an explanation of the 90 day grace period for enrollees with premium tax credits pursuant to 45 CFR 156.270(d). Your payment is due on the first of the month. If we do not receive your premium payment by that date, you have entered your three-month grace period. During the second and third month of your grace period, any claims you submit will be pended. These claims will not be paid until your bill is paid in full. If your doctors, hospital, or pharmacy send in claims for you while you are in the second and third months of your grace period, Blue Cross NC is required to tell them your bill is past due. They will be told they will not be paid unless you pay your bill before the end of the third month. These providers will also be able to check and see if you have paid your bill before they submit more claims for services. To come out of the grace period and not have your policy terminated, you must pay your account in full. If you do not pay the premium in full by the end of the three-month grace period, your coverage will terminate the last day of the first month of the three-month grace period and you will be liable for any charges for services rendered during the second and third months of the three-month grace period. We will keep any premium payments made toward the first month's premium, during which you had coverage, and return all other premium amounts applied to the second or third months. Also, if you apply for another Marketplace policy in the future, you may have to pay any amount you owed for your old plan and the first month's premium for your new plan before your coverage starts. Claims may be denied retroactively, even after the enrollee has obtained services from the provider based on retroactive changes to eligibility, which include, but are not limited to failure to pay premiums and instructions from the Marketplace. Any premium overpayments will normally be credited to your account and applied to future premiums due. Should you wish to obtain a refund, the policy owner can contact customer service and request a refund. Medical necessity is used to describe care that is reasonable, necessary, and/or appropriate, based on evidence-based clinical standards of care. Prior authorization (prior review) is a process through which an issuer approves a request to access a covered benefit before the insured accesses the benefit. In-network providers in North Carolina are responsible for requesting prior review when necessary. In-network providers outside of North Carolina, except for Veterans' Affairs (VA) and military providers, are responsible for requesting prior review for inpatient facility services. For all other covered services received outside of North Carolina, you are responsible for ensuring that you or your provider requests prior review by Blue Cross NC or its designee even if you see an in-network provider. For inpatient or certain outpatient mental health and substance abuse services, either in or outside of North Carolina, use the information on the back of your ID card to request prior review and receive certification. Prior review is not required for an emergency or for an inpatient hospital stay for 48 hours after a vaginal delivery or 96 hours after a Cesarean section. You are responsible for ensuring that you or your out-of-network provider, in or outside of North Carolina, requests prior review by Blue Cross NC or its designee when necessary. See "Who to Contact?" in your benefit booklet for information on who to call for prior review and to obtain certification for mental health and substance abuse services and all other medical services. Failure to request prior review and obtain certification will result in a full denial of benefits. However, prior review is not required for an emergency or for an inpatient hospital stay for 48 hours after a vaginal delivery or 96 hours after a Cesarean section. Blue Cross NC will make a decision on your request for certification within a reasonable amount of time taking into account the medical circumstances. The decision will be made and communicated to you and your provider within three business days after Blue Cross NC receives all necessary information. However, it will be no later than 15 calendar days from the date Blue Cross NC received the request. Blue Cross NC may extend this period one time for up to 15 days if additional information is required. Blue Cross NC will let you and your provider know before the end of the initial 15-day period of the information needed and the date by which Blue Cross NC expects to make a decision. You will have 45 days to provide the requested information. As soon as Blue Cross NC receives all the requested information, or at the end of the 45 days, whichever is earlier, Blue Cross NC will make a decision within three business days. Blue Cross NC will let you and the provider know of an adverse benefit determination electronically or in writing. You have a right to an urgent review when the regular time frames for a decision: (i) could seriously jeopardize your life, health, or safety or the life, health or safety of others, due to your psychological state; or (ii) in the opinion of a practitioner with knowledge of your medical or behavioral condition, would subject you to adverse health consequences without the care or treatment that is the subject of the request. Blue Cross NC will let you and your provider know of its decision as soon as possible, taking into account the medical circumstances. Blue Cross NC will notify you and your provider of its decision within 72 hours after receiving the request. Your provider will be notified of the decision, and if the decision results in an adverse benefit determination, written notification will be given to you and your provider. If Blue Cross NC needs more information to process your urgent review, Blue Cross NC will let you and your provider know of the information needed as soon as possible but no later than 24 hours after we receive your request. You will then be given a reasonable amount of time, but not less than 48 hours, to provide the requested information. Blue Cross NC will make a decision on your request within a reasonable time but no later than 48 hours after receipt of requested information or within 48 hours after the time period given to the provider to submit necessary clinical information, whichever comes first. Issuers' exceptions processes allow enrollees to request and gain access to drugs not listed on the plan's formulary, pursuant to 45 CFR 156.122(c). Blue Cross NC has a process for an enrollee, the enrollee's designee, or the enrollee's prescribing physician (or other prescriber) to request a standard review of a decision that a drug is not covered by the plan. Blue Cross NC will make its determination on a standard exception and notify the enrollee or the enrollee's designee and the prescribing physician (or other prescriber, as appropriate) of its coverage determination no later than 72 hours following receipt of the request. Blue Cross NC has a process for an enrollee, the enrollee's designee, or the enrollee's prescribing physician (or other prescriber) to request an expedited review based on exigent circumstances. Exigent circumstances exist when an enrollee is suffering from a health condition that may seriously jeopardize the enrollee's life, health, or ability to regain maximum function or when an enrollee is undergoing a current course of treatment using a non-formulary drug. Blue Cross NC will make its coverage determination on an expedited review request based on exigent circumstances and notify the enrollee or the enrollee's designee and the prescribing physician (or other prescriber, as appropriate) of its coverage determination no later than 24 hours following receipt of the request. If Blue Cross NC denies a request for a standard exception or for an expedited exception, Blue Cross NC has a process for the enrollee, the enrollee's designee, or the enrollee's prescribing physician (or other prescriber) to request that the original exception request and subsequent denial of such request be reviewed by an independent review organization. Blue Cross NC will make its determination on the external exception request and notify the enrollee or the enrollee's designee and the prescribing physician (or other prescriber, as appropriate) of its coverage determination no later than 72 hours following its receipt of the request, if the original request was a standard exception request and no later than 24 hours following its receipt of the request, if the original request was an expedited exception request. Once Blue Cross NC has all necessary information to make a decision, Blue Cross NC will provide a response to the member and their provider approving or denying their request (if approved, notice will provide duration of approval) within applicable timeframes. An EOB is a statement an issuer sends the enrollee to explain what medical treatments and/or services it paid for on an enrollee's behalf, the issuer's payment, and the enrollee's financial responsibility pursuant to the terms of the policy. An EOB is generated after a claim has been received and processed. In-Network: Doctors, hospitals, clinics, and other health care providers who have a contract with your plan to provide services to you at a discount. Out-of-Network: Services from health care providers who don't have a contract with your plan will usually cost you more than those received from an in-network provider. Out-of-Pocket: The total amount that you will pay during a policy period before your plan begins to pay at 100% of the allowed amount. This limit may include copayments and deductibles. It does not include your premium, charges over allowed amounts, or services that are non-covered. Plan's Maximum: This is the specific deductible, coinsurance, or out-of-pocket amount for your plan, and what you may owe cannot exceed these amounts. This does not include copayments or non-covered services. Amount Satisfied: The total amount of the deductible, coinsurance, and/or out-of-pocket expenses you and/or your family has met for the benefit period as of the date of the EOB. Remember, copayments, if applicable are not applied to the deductible, coinsurance or out-of-pocket amounts. Note: If you have met the required amount, this field will simply show "Met" on the EOB. Claim Number: Identifies specific services received during a health care visit through a uniquely assigned number. Your Provider Billed: The amount your health care provider submitted for the services you received. You may notice this amount is often higher than the allowed amount. The advantage of being a member of your plan is that the provider has agreed to accept a reduced amount (allowed amount) for the services you received and your liability is based on the allowed amount and not the billed amount. Allowed Amount: The discounted rate your plan has negotiated with in-network providers and facilities for covered services. These rates save you money when you receive in-network care. Member Savings: The amount you saved by visiting an in-network provider or facility and being a member of your plan, entitling you to receive these negotiated discounts. Your Plan Paid: The amount your plan paid for the services you received. Copayment: The fixed dollar amount you pay up front to a health care provider for a covered service. Copayments may count towards out-of-pocket maximum. They do not count towards the deductible. Deductible: The amount you pay for eligible services during a benefit period before your plan begins to pay. The deductible may not apply to all services. This means you may be able to pay a copayment rather than the full amount. (Check your policy for details). Copayments, coinsurance, noncovered services, or any charges in excess of any maximum or allowed amount are never applied to your deductible amount. Note: Your plan may have different deductible amounts for services in and out of the Blue Cross NC provider network. Individual Deductible: If you have dependents on your policy, each person may have an individual deductible that is applied toward a total family deductible. Family Deductible: Your family has a deductible for all covered members on your policy, if applicable. When the sum of all family member payments satisfies the family deductible, each member begins to make payments at the coinsurance rate. Please note that some policies require that a specific number of family members must meet their individual deductibles first before the family deductible is met. Coinsurance: Your share of the costs of a covered health care service, calculated as a percentage of the allowed amount for the service. You pay coinsurance plus any deductibles you owe. Once you reach your coinsurance maximum, your plan will pay 100% for covered services for the rest of the benefit period. Other Liability: Out-of-network providers do not have contracts with us to agree to lower negotiated rates, thus, they can bill you for more than your plan's allowed amount. Also, if you or the out-of-network provider does not get prior review or prior authorization for services that require such approval in advance, the out-of-network provider can bill you for the entire charge. If you have any excluded services, (services your plan does not cover) they will appear in this column as well. Total: The amount you owe the provider, including any applicable copayment, deductible, coinsurance or other liability. If you have already paid a copayment or any other upfront payment to the provider, it will not be reflected here. This information will help you confirm that anything you paid to the health care provider at the time of service was the correct amount per your plan. Your plan is not notified by your provider when you have made any payments to them. Reason Code: Indicates an explanation is available in the "What Our Codes Mean" section at the end of the EOB. These reasons are used to explain how a service was processed and gives additional information to help you understand how the plan determined what it will pay for the services you received. Service: A summary description of the type of medical service provided. If you need more information about a particular service, contact your health care provider to discuss the details of how they filed the claim with your plan. Alternatively, you may call customer service at the number listed on your EOB or ID card. Coordination of Benefits exists when an enrollee is also covered by another plan and determines which plan pays first. Coordination of benefits (COB) means that if a MEMBER is covered by more than one insurance plan, benefits under one insurance plan are determined before the benefits are determined under the second insurance plan. The insurance plan that determines benefits first is called the primary insurance plan. The other insurance plan is called the secondary insurance plan. Benefits paid by the secondary insurance plan may be reduced to avoid paying benefits between the two plans that are greater than the cost of the health care service. Please refer to your benefit booklet for the rules used to determine which plan is primary and secondary.